What does “holiness” mean to a child who is five years old? God’s holiness is an extremely important theme running throughout the entire Bible and I believe even very young children can experience how special God is. I’ve recently had an opportunity to teach in a large room so I decided to dedicate one area of the room as a special place where, each week, we sit for a few minutes and talk about how special God really is. I’ve loved how this has brought a new depth to what we are learning and I would encourage you to give this a try sometimes. I didn’t buy anything to set this space up and, with a little imagination, you will be able to find “special” items of your own. I drug in a coffee table from another room. I covered it with some shiny wrapping paper and placed chairs around it. Draping some old sheets and fabric over a room divider formed a small “wall” to make the space cozy. Someone had left some “gold” Christmas tree garland in our supply room so I thought that would add to the feeling of grandeur. A paper crown on a purple pillow emphasized the Kingship of God since we were studying the Divided Kingdom and the End of the Kingdom. Even though these were not expensive items I can tell you that the children were in awe of the space. On a side note it occurred to me that the Temple that Solomon built was dripping with gold and precious cloths in a way that left everyone awestruck. But, in reality, gold and expensive items are actually worthless in comparison to God’s true worth. Perhaps we adults aren’t all that sophisticated after all. When we sit at the table in this space it is a “set apart” time from the rest of the class period. At other times we might play games and sing action songs and act out the story. There are many ways to glorify God. But, when we go and sit in our holy space we speak more quietly and we all reflect in awe and reverence about God. This is a 5 minute devotional time that is not limited to the lesson we are studying for the day. Everything we talk about in this space relates to how special God is. He is approachable but He is different than us. In a child’s eyes this space is very special and it is a great launching place to talk about how God is even more special than our idea of precious things. The Word of God- We open our Bibles and read a verse about God (or they follow along as I read). This experience has brought a new depth to the lessons I’ve been teaching. The children have really picked up on the fact that sin is not just “bad behaviour” it is a real offence against who God is. I’ve been amazed at how often the children have referenced God’s holiness as we study other lessons. When we learned about the prophet Jeremiah visiting the potter’s house and hearing God warn about turning away from him the children understood why God was angry. The kings were not treating him in the way he deserved. 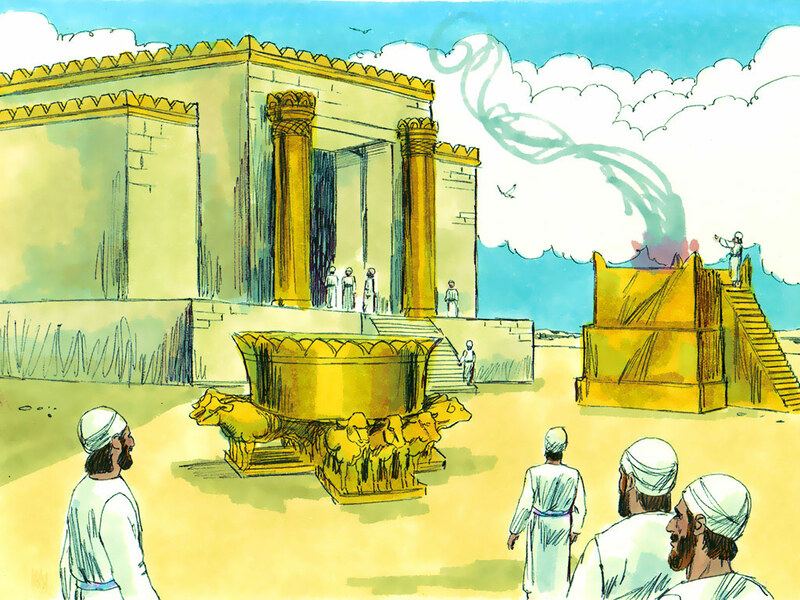 Before being led off into Exile the Temple of God was destroyed. The students in my class were so sad to hear this. They understood how serious this was to God. 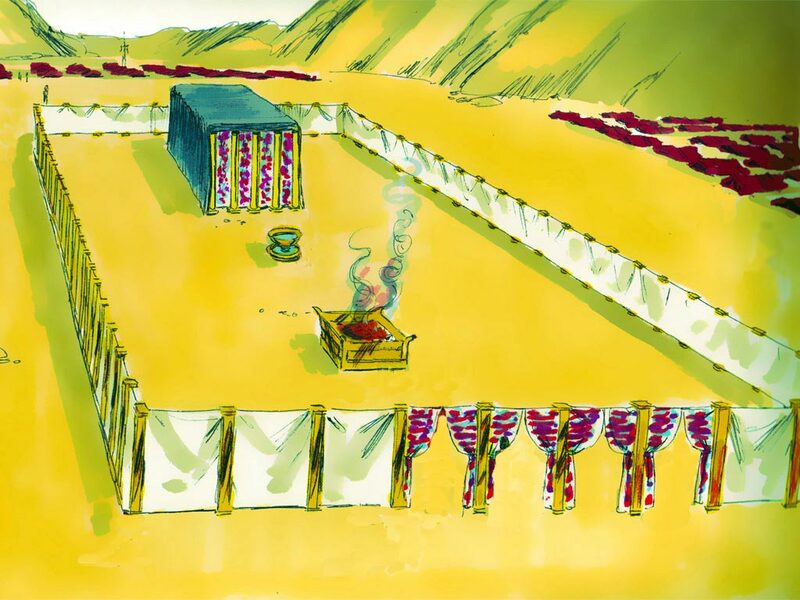 How About Making Your Own Temporary Tabernacle? I was blessed with a room large enough to create a separate space but you could create a special space almost anywhere. Put your “special” items in a basket and lay out the items when it comes time to have your devotional. After all, this is exactly what was done with The Tabernacle. It was set up and taken down wherever the Israelites camped. If you asked me what my Bible Class was like this week I would have to say it was quite destructive…in a good way! As I read about King Josiah and his zealous destruction of idols and places of false worship I wrestled with how I would relate the severe actions of destruction and even death to the lives of these 4 and 5 year olds without giving them nightmares or encouraging destructive behaviour in general. How do we relate tough lessons in the Bible to children? God is Holy and Josiah believed this passionately and wanted to honour him. God desires and commands our sole worship. Josiah was indignant about the prevalent idol worship in the kingdom. God expects to be taken seriously. Josiah took his kingship seriously and was determined to change his kingdom. God displays emotions but he always does the right thing. Josiah’s anger, indignation and outrage did not lead him to sin. These emotions propelled him into actions that honoured God. God’s Word is true. Josiah had respect for God’s Word and obeyed it. God is concerned about everyone. As king, Josiah displayed leadership and shared God’s Word with his people. Trying to teach all of these would have been too much for 4 and 5 year olds to comprehend so I focused on just two main points that I thought they could best relate to. I felt confident in the priority of these choices since they are also how God started when he issued the 10 Commandments. Do not worship idols or anything else besides God. We spent time in a “special” area I had created in our classroom. I wasn’t trying to re-create the temple but I made the space special with some silver wrapping paper and some strings of gold beads that I found. As we sat in this space we read from God’s special book, talked about the special tabernacle and temple and then spent some time talking about how God is different and holy. After sharing the Bible story we spent some time destroying idols! The children took turns finding a scroll I hid underneath some carpet tiles. If they found the scroll they “read” it. Once they found and read the scroll they then followed Josiah’s example in clearing out all of the idols. The biblical version is much more graphic. We expressed our outrage by kicking them and knocking them down. To conclude the class we gathered in and focused on God’s holiness one more time. For older children I would follow up by taping pictures of other “idols” on the boxes to show that anything we place as more important than God can be our idol. This might include possessions, beauty, sports…and the list goes on. Click here to download instructions and pictures for the “Destroying Idols” activity. Click here for resources for teaching about Josiah. I have to be honest, Halloween is not exactly my favourite holiday. But one thing I really like about it is what happens afterwards. After the big rush (and sometimes even before) there are all sorts of skeletons on sale! Why is this a good thing, you might ask? Why would I need to stock up on skeletons and stow them away in my closet? It’s simple…I’m a Bible teacher! Bones and skeletons are great visual aids and conversation starters for the story of Ezekiel and the Valley of Dry Bones from Ezekiel 37:1-14. I love to tell this story of hope. This vision has the vital elements needed for a dramatic story. The kids love the “creepy” image of dry bones lying all over a valley. They can relate to how Ezekiel must have felt when the bones began rattling and coming together. Tendons and flesh formed on them and finally God breathed his spirit into them. If Ezekiel was hopeless because his people were in captivity he could finally understand how God had the power to bring a nation back to life. As a teacher I am always on the lookout for items that will help me share God’s Word in ways children can best relate to. No one has to spend a lot of money or buy new things to teach children about God. But if you live in a place where after-holiday sales provide extremely cheap items then this may be a great opportunity. What are the holidays where you live? Creche and manger scenes (angels, wise men, animals, Joseph, Mary, Jesus, the manger itself), pictures of Jesus as a baby, stars and spices like the wise men brought. The obvious uses are for stories such as The Birth of Jesus and Wise Men and a Star. Gaudy plastic strings of gold and silver garland can make great “treasure” when you later tell the Parable of a Treasure & a Pearl. Greenery, artificial trees, candles and even twinkling lights bought in after-Christmas clearance sales really come in handy for costumes and acting out Bible stories later on. You’re going to enjoy pulling twinkling lights out of storage when you tell the story of Jesus Teaches about Salt and Light. Heart decorations of all kinds. These could be used when talking about the heart. This is the obvious time to find things like books and figurines to help you later tell the story of the Burial and the Resurrection of Jesus. Since I teach infants and toddlers I sometimes use the little wind-up bunnies when I teach about Day 6-God Created Animals & People. And I like to have a few plastic eggs on hand throughout the year so I can put verses or pictures inside and let the children hunt for them. They are also great for telling the story of death, burial and resurrection of Jesus with Resurrection Eggs. Candy and lollies if you use those as game prizes. We can give thanks throughout the year so I’ve sometimes used items on sale after this holiday to teach stories such as Jesus Heals Ten Lepers. And all of plastic fruit comes in handy for teaching about The Fruit of the Spirit. Respect is feeling that something or someone is valuable and worthy of honour while at the same time showing this feeling by actions. Both feeling and acting are required for respect. Actions without feeling are not respect. The statement “I respect you” is not respect when it is not lived out. Respect God. God is worthy of our words and actions. Respect others. God created other people so we respect God by respecting others. Respect yourself as one who has been created and loved by God. 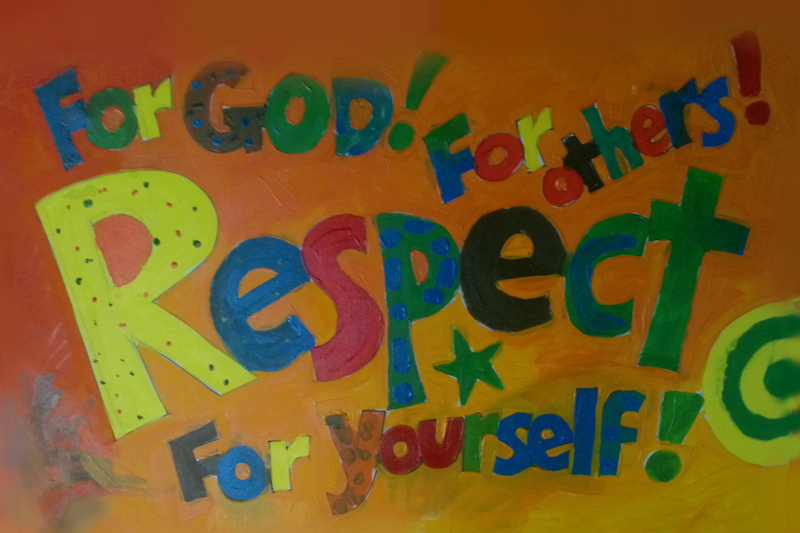 While studying the bible character, Daniel, we explored the idea of respect. In the story of the Writing on the Wall in Daniel chapter 5 King Belshazzer hosted a drunken party. Instead of normal dishes he served food and wine in the special temple dishes used in worship to God. His disrespect for God ended badly for the king. During the party a mysterious hand appeared and wrote “Mene, Mene, Tekal, Parsin”. The king was afraid and eventually Daniel was called in to interpret the words. Daniel told Belshazzar that the king was arrogant and had insulted God. The words meant that Belshazzar’s time was finished. He died that very night. Because God is a personal Spirit…I will seek intimate fellowship with Him. Because God is all-powerful…He can help me with anything. Because God is ever-present…He is always with me. Because God knows everything…I will go to Him with all my questions and concerns. Because God is sovereign…I will joyfully submit to His will. Because God is holy…I will devote myself to Him in purity, worship, and service. Because God is absolute truth…I will believe what He says and live accordingly. Because God is righteous…I will live by His standards. Because God is just…He will always treat me fairly. Because God is love…He is unconditionally committed to my well-being. Because God is merciful…He forgives me of my sins when I sincerely confess them. Because God is faithful…I will trust Him to always keep His promises. Because God never changes…My future is secure and eternal. 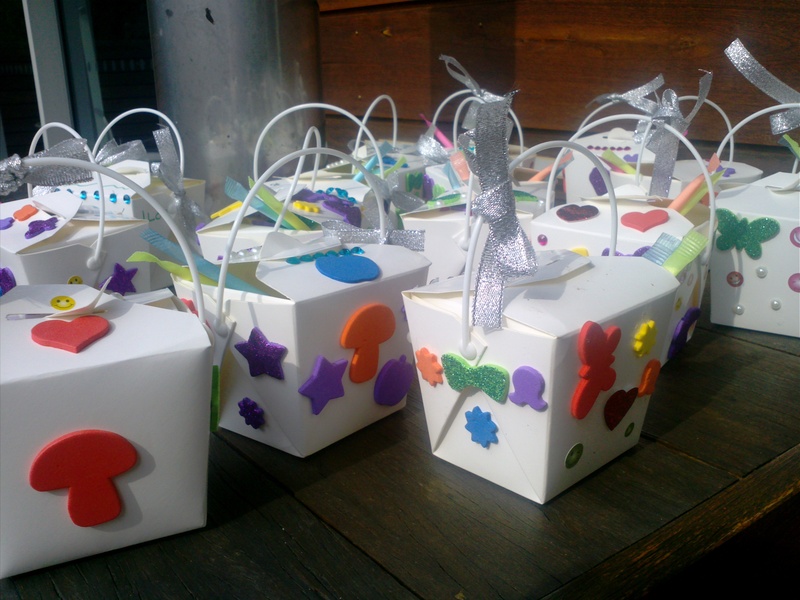 Decorate small boxes and place the cards inside. We used Chinese Take-out boxes but you could use any kind of box or bag. Guided Conversation: As the children are decorating the boxes the teacher can continue conversation about the various attributes of God and how these attributes lead to our respect for him. 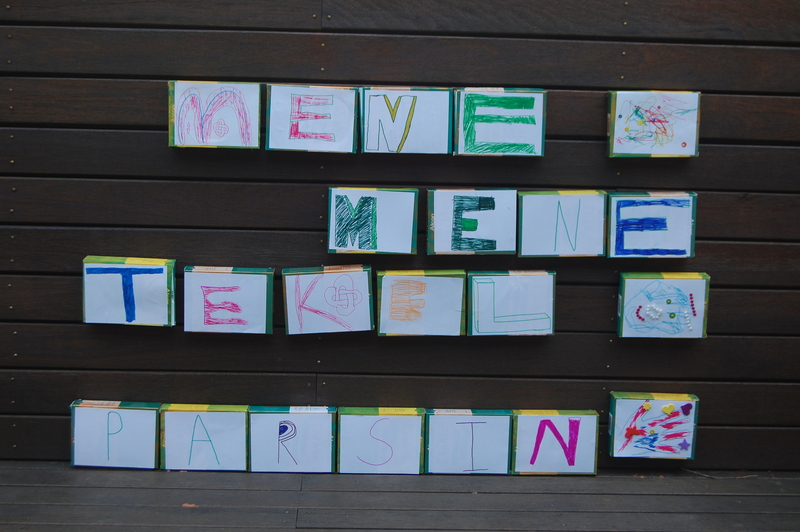 We assigned different letters to children and had them put them together to form the words “MENE MENE TEKEL PARSIN”. No one knew beforehand what the letters were going to spell so the children had to put them together like a puzzle. Continue the earlier discussion and talk about how we should try to reflect the attributes of God in our personal lives. Guide children in writing their name down the left side of the paper. Beside each letter they should write something about God that starts with that letter (example below). Encourage the children to circle one attribute that they would like to be better at. Teacher should pray for the children one by one for the item circled. The children will learn this verse together through repetition. The challenge is to say the verse again and again even though an increasing number of words are covered up. Print the verse on a paper before class. Provide the children with scraps of paper and glue. Place the printed verse on the table top and guide children in reading the verse together with you. Child glues one of the small bits of paper over a word and then everyone says verse again. The paper then passes to the next person so they cover another word. Everyone recites the verse again. One at a time cover word(s) and repeat until all words are covered and verse is memorised. More resources for this story can be found at Writing on the Wall. I just finished participating in a 3 day holiday programme where we had 3 different lessons from the book of Daniel. In the first day we studied Daniel chapter 1 and talked about how Daniel and his friends were taken into captivity by the Babylonians. Then we covered the story of Daniel and the King’s Food and talked about how Daniel and his friends respected God and respected themselves enough to eat the healthy food God allowed instead of what the Babylonian King offered from his table. During the prayer time we talked about how God was with Daniel and his friends even when they were chained and forced to leave their homes and families. God heard Daniel’s prayers and he hears us when we pray. 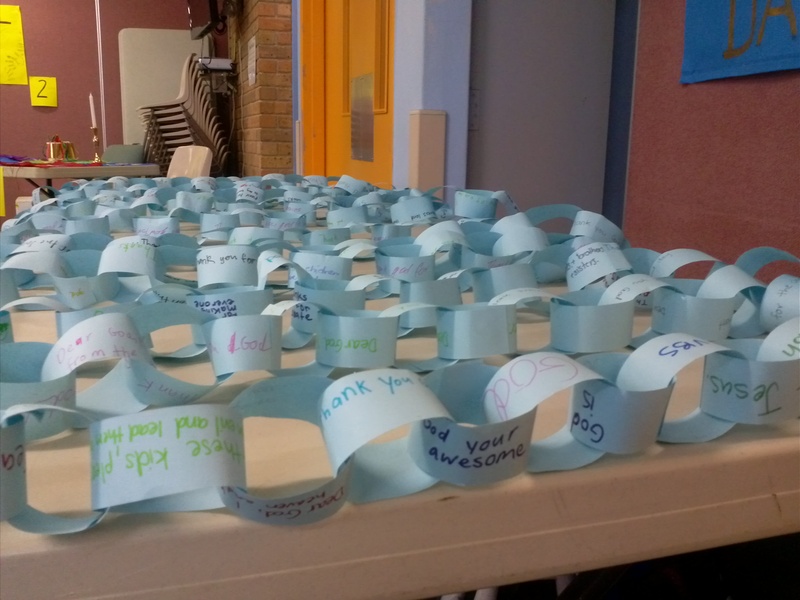 We wrote prayer requests on slips of paper and put them together into chains. 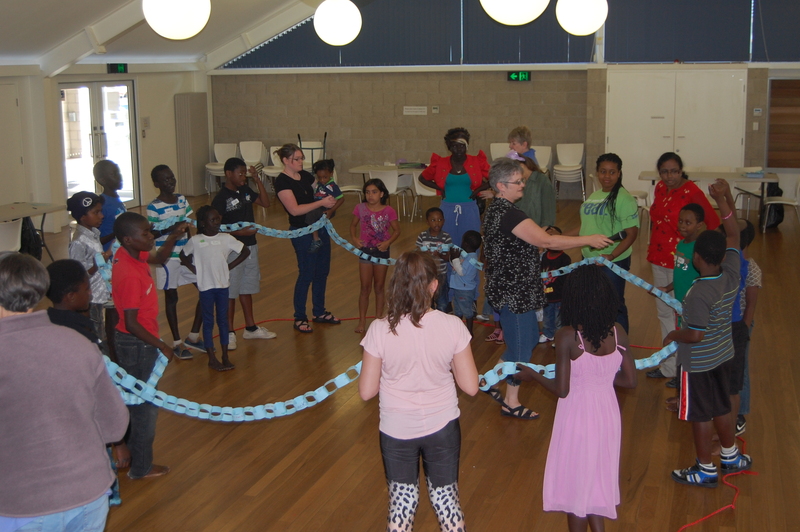 Then we took turns choosing links of the chain and praying the requests. In the end everyone joined their chains together to make one very long chain. Daniel and his friends refused to eat the food that King Nebuchadnezzar offered because it was food that God did not allow his people to eat. Instead they chose the healthy food that was approved by God. 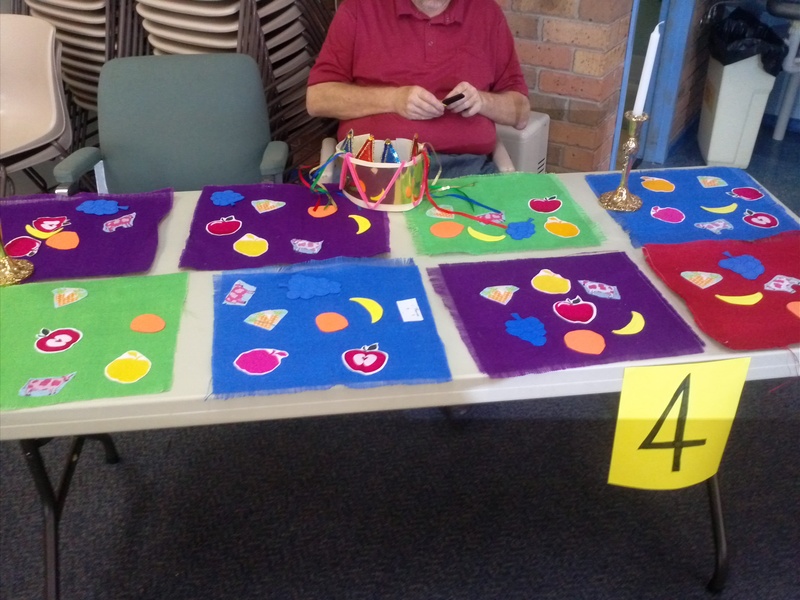 We pre-cut place-mats from burlap (hessian) fabric and then provided fabric glue and fabric pictures of healthy food so the children could decorate the place-mats. The children loved this one! 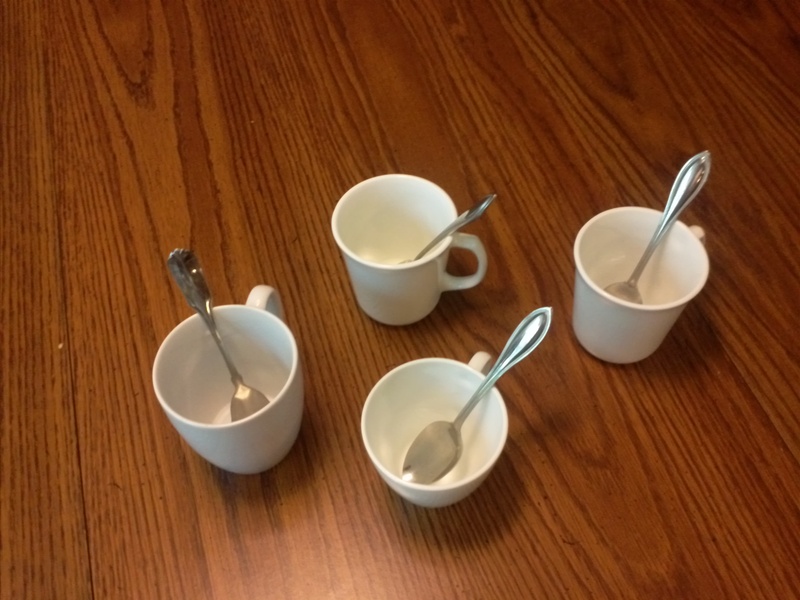 We placed small amounts of food in cups and then blind-folded one child at a time so they could taste the food and guess what it was. Each child tasted one food item The other children got to watch the facial expressions of the one testing the food. Our aim was a variety of tastes including sour, sweet, bitter and salty. So we chose lemon juice, chocolate sauce, vinegar, ketchup, soy sauce, honey and fish sauce.